Macrocytic anemia, glossitis, peripheral neuropathy, weakness, hyperreflexia, ataxia, and other neurological manifestations characterize classical vitamin B12 (cobalamin) deficiency. It is common, however, to encounter patients with vitamin B12 deficiency who have atypical clinical or laboratory features. For example, many patients present with neurological defects without macrocytic anemia. Assay of serum vitamin B12, widely used as a screening test for cobalamin deficiency, has significant problems regarding sensitivity and specificity. A falsely low serum vitamin B12 level may be seen in the absence of true deficiency, and conversely neurological manifestations of vitamin B12 deficiency may be present despite normal or minimally depressed serum vitamin B12 levels. Methylmalonic acid, a substrate that requires cobalamin for its metabolism, is elevated in states of true functional vitamin B12 deficiency. Assay of serum methylmalonic acid is thus a sensitive test for vitamin B12 deficiency at the cellular level. It is useful for confirming a suspected diagnosis of vitamin B12 deficiency in patients who have a normal or low-normal serum vitamin B12 level (200-300 ng/L). Intrinsic factor blocking antibodies are detectable in the serum in approximately 50% of patients with pernicious anemia, and are highly specific for the diagnosis. A positive result for this assay establishes a diagnosis of pernicious anemia, but a negative result does not rule it out. Serum gastrin is elevated in gastric atrophy, which is always present in pernicious anemia. A normal serum gastrin level rules out the diagnosis of pernicious anemia, indicating either that the vitamin B12 assay was falsely low, or that there is another cause of vitamin B12 deficiency such as a dietary cause or intestinal malabsorption. Although some authorities believe that an elevated gastrin level in a patient with vitamin B12 deficiency is sufficient to establish a diagnosis of pernicious anemia, others feel that a Schilling test is still indicated to confirm the diagnosis, since gastrin may also be elevated in atrophic gastritis. If the vitamin B12 deficiency is to be treated with oral (rather than parenteral) cyanocobalamin, it may not be necessary to make this distinction (There is recent evidence that patients with pernicious anemia can be effectively treated with large oral doses of cyanocobalamin). The Schilling test may still be required to identify vitamin B12 malabsorption and confirm a diagnosis of pernicious anemia in those patients with established vitamin B 12 deficiency who have negative intrinsic factor blocking antibodies and an elevated serum gastrin level. 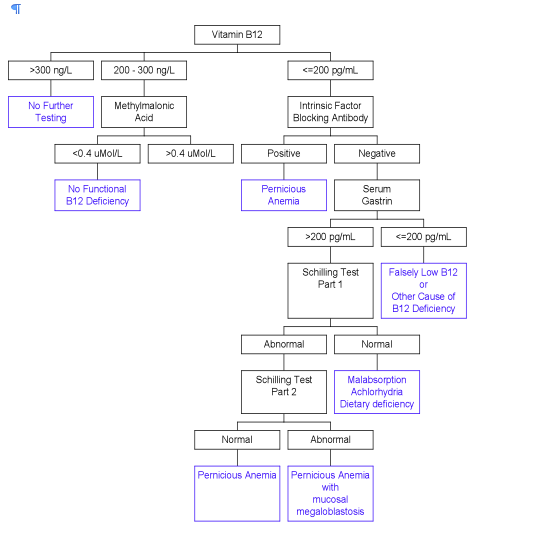 Patients with classic pernicious anemia have an abnormal test when radioactive vitamin B12 is given alone by mouth (part I) and this is corrected when the test is repeated with intrinsic factor (part II). The test is time-consuming and expensive, and subject to various interfering factors such as an incomplete 24-hour urine collection, or therapeutic administration of vitamin B12 in the 48 hours preceding the test. The need for the test can, however, be significantly decreased if it is used only as delineated above.